Mobile home parks. Self-storage lots. Residential housing. 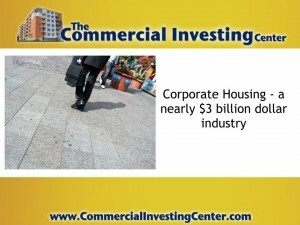 Commercial housing. These are just some of the ways investors can approach income property investing. But there’s one strategy we haven’t spent much time discussing and, truth be told, it’s a pretty big industry, to the tune of about $2.5 billion annually in gross rents. Popularly referred to as corporate housing, the term refers to short-term residential leases that might run anywhere from a week to a month or longer. What kind of tenant is interested in these types of rentals? A few would include visiting nurses, baseball players during spring training, snowbirds, traveling shows, or even a mother and daughter in town for a few weeks to look for jobs. This class of rental originally drew its name from the corporate field when businesspeople on temporary assignment or relocation needed a temporary place to stay. 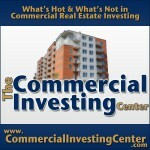 Posted in Blog Articles and tagged corporate housing investing, how to become a landlord, income property investing, jason hartman, The Commercial Investing Show.